Today I want to talk about what appliances we purchased, why we chose them specifically, and now, seven months later, how they are holding up. Here is our newly renovated kitchen. Check out all the before and after pictures! While selecting our appliances, we kept quality and price in mind. We wanted great quality products in the mid-range price. There are some amazing appliances out there if you go high-end enough, but we didn’t want to spend multi-thousands of dollars on one appliance. There are also some very inexpensive products out there that had terrible reviews. We tried to find the middle ground; the best quality appliances that were also reasonably priced. The majority of our research was done on Consumer Reports. When making a large purchase we like to start with Consumer Reports, and then also read reviews on places like amazon or big box store websites. Let’s start with the range and microwave. Initially we researched ranges and microwaves separately. No series of any brand had a top rated range and top rated microwave that matched. 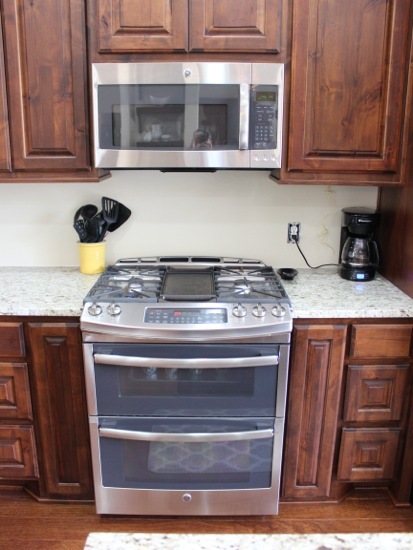 We wanted a matching combo since the microwave would be mounted above the range, so we found the range we wanted and then purchased the matching microwave. To select our range, we first had to narrow down what type of range we wanted. There are many options available. Our must-haves were 1) gas, 2) range (not a separate oven and cooktop), 3) double oven, 4) at least 4 burners, preferably 5, and 5) a flush-back with controls on the front (aesthetically I like this look better). The GE Profile Series was top rated on Consumer Reports for quality as well as price. After reading about many other range options, we settled on the GE Profile Series because it met all our criteria, plus it had a few extras we liked. We chose the GE Profile Series microwave because it matched. Having said that, if it were rated terrible we would not have chosen it, but since it came in with an average rating we figured it would be good enough. The additional features on the Range that really sold me were a) the reversible Lodge brand cast-iron griddle/grill, and b) the heavy-duty roller rack inside the top oven. The microwave also has some additional features that I’ve been very impressed with. It has a timer (so many don’t! ), Express Cook and 30 second button (I tap one button and it automatically starts), and the timer, vent fan, and surface light are big easy to find buttons at the very bottom. First off, I don’t know if this was the gas company’s fault when they installed the range, or if it was GE’s fault, but the top oven stopped working within weeks of having it hooked up. GE happily and quickly sent a tech out. After ordering the broken part the oven was back up and running within only a few days. No harm, no foul. Just a bit frustrating to have a broken oven within a few weeks of purchase. I want to say the issue had to do with the ignitor, but I am not 100% sure. Secondly, the digital touch pad. It seems to be a resistive screen versus a capacitive screen, meaning I have to actually push the button instead of just touching it like I would on an iPhone. Sometimes the screen registers with hardly a tap but other times I feel like I have to try several times for it to register my touch. Sometimes I tap it over and over with a finger trying to get it to respond and it won’t, yet at other times, simply brushing up against it with my shirt or pant leg will set it off. Because of it being so weirdly sensitive (only at inconvenient times, but not when I actually want it to be), I have to keep the lock screen on at all times. Otherwise I might inadvertently start the “clean oven” mode or set it to delay start several hours later. Also, if the screen is dirty at all, it is not responsive at all. While cooking it will get dirty with splatters and I have to wash it off with glass cleaner or a lysol wipe to get it to function again. I don’t know if this is the way it is supposed to be functioning. I have never called GE about this issue, so it may just be an issue with my specific range. I will call today and ask them and update this post in the future with a final answer. Third, the power burner on the front left. It’s basically two burners, one inside the other. When the power part is on, it burns REALLY hot. Like, almost too hot to even use. However, when you turn the “power” part off, the little burner inside is so small it almost doesn’t even simmer anything. There seems to be no middle ground. Having said that, I am not a chef, and I am not a professional by any stretch of the imagination. I assume that people that are more into cooking probably have very good uses for that burner and probably love it. I pretty much only use it to boil water and cook noodles. The ONLY complaint I have with the microwave is the way it is packaged in the box. I removed the lid the exact way the box said to, and when I pulled the lid off the glass plate that goes inside the microwave flew out of the box and shattered on the floor. I immediately called GE and they had a new one to me within a couple days. I suggested to them they might want to reconsider how they package their microwaves. Other than that, I love the microwave and have absolutely no complaints. I would absolutely purchase this range and microwave again. The pros and ascetics of the range outweigh its quirks. I have no cons with the microwave. We did all our dishwasher research at Consumer Reports. We went with Bosch because they were top rated for dishwashers over every other brand. Bosch is a more expensive brand, so we went with a no-frills dishwasher over one with additional drawers or extra features. We love this dishwasher. It is super quiet, it looks good, it has amazing capacity and can hold pretty much whatever we cram in it, and we don’t even have to pre-rinse our dishes before loading it up. The dishes come out clean and sparkly. I have zero complaints about this dishwasher and I would absolutely purchase it again in a heartbeat. The sink and faucet were both purchased at Costco.com. I enjoy purchasing at Costco because I feel like they have done most of the research for you. Costco tends to carry good-quality middle of the line products. My experience with Costco for as long as I’ve been a member (many years), is that I can trust their products. If they are selling a product, it usually ends up being good quality. There are always exceptions to this rule, but for the most part they tend to not let me down. 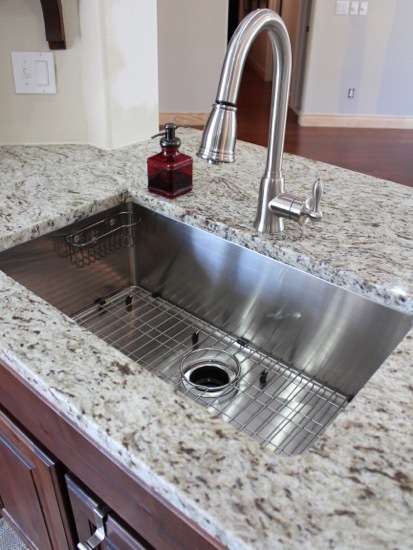 I knew from day one I wanted a stainless steel deep single bowl sink. This is a personal preference, and I just knew what I wanted. This sink has been excellent so far and I am super happy with it. I love that I can wash several pots and pans and a large crockpot bowl all at once and it all fits! If I wash many small items at once (usually I don’t because dishwasher), I purchased a plastic square dish tub at Target for a couple bucks that I will set inside the sink and fill with soapy water. The tub is stored under the sink and I use it very infrequently. I have absolutely no complaints about this sink and I would absolutely purchase it again. The faucet I am mixed about. I like the look of it. I like that the spray function stays on without me having to hold down a button. I like the tall arched neck that allows for plenty of room under it. There are a few cons though: The head doesn’t like to stay tightly in the neck. It tends to slip out and I am constantly pushing it back in. Also, the head will randomly start dripping occasionally for no reason hours after we last used it. This will generally only last for a few minutes then it will stop again. Also, this probably is a universal faucet issue, but after washing something and my hands are wet, adjusting the handle leaves water all over my countertop. I don’t think that is avoidable though so I just usually leave a small folded up towel under the handle. Honorable mention: We also purchased our garbage disposer at Costco.com. We purchased the WasteKing 1 HP Universal Mount Garbage Disposer and it has been awesome. Best garbage disposal (disposer?) I’ve ever used. We haven’t purchased the refrigerator yet, but this is the one we are going to purchase. We currently have this LG refrigerator and we LOVE it. Love love love it. It is actually the 2nd of the same identical refrigerators we have purchased in the past 6 years. Our first was for our house in Dallas (before I started blogging). When we sold that house, they wanted the fridge with the house. We loved it so much we bought the same one again when we moved to Austin. Before we sold that first Dallas house our best friends lived there and rented for several months before we sold it. They also loved the fridge so much that they too purchased the exact same fridge for their new house. Well, now we need a new fridge that is counter-depth and stainless steel. We are absolutely purchasing an LG french door refrigerator. We might spring for the one with the water dispenser, but we aren’t 100% sure yet. I tend to not like them because the water takes up so much storage space inside the fridge, but the idea of one sounds fun. 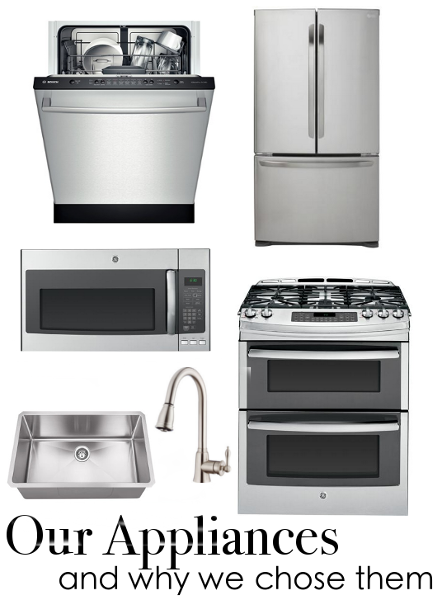 When we purchased our appliances we shopped around and found the best deals. We ended up getting the range, microwave, and dishwasher from Best Buy during a promotional sale they had going on. Everything else came from Costco. When we purchase the fridge we will shop around until the best deal pops up. If anyone sees this LG counter-depth fridge on sale anywhere please let me know! I will answer any questions you have about our purchases in the comments below, so just post your questions and I will respond to each one separately (so you can view them easier). The kitchen looks great!! We purchased a 60 year old house and just finished the renovations this past November. I have the same faucet as you, and I have had no issues with it. Seems like a silly question, but have you checked to see if the hose is getting caught on something and not allowing it to fully retract? Also, try moving the weight to a different position. That worked for me with a previous faucet. Love your stove. We, too, went with a slide in. I just liked the look as we were doing a chimney vent instead of cabinets and microwave over the top. I got the Electrolux with all touch controls. It was a bit pricey, but worth it to me to not have to clean around knobs. Also, I’m totally with you on the LG fridge. We love ours! It is a French door as well. It’s not counter depth, but we have it in a built in cabinet. It has the ice and water in the door. It has the slim ice maker in the door vs the body, so you don’t loose space. It also has a second ice maker in the freezer below that you can turn off and on if you need extra ice. I like that it makes little square cubes instead of the half moon shaped ones. 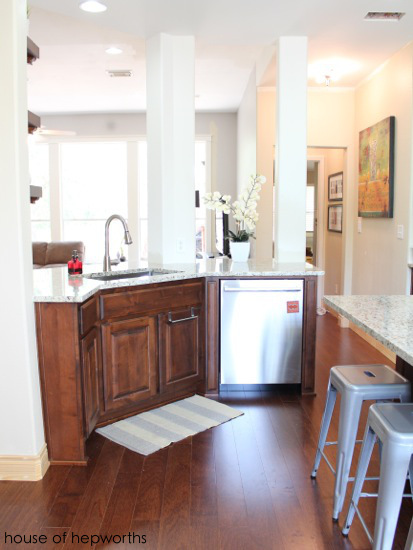 Again, love the kitchen and good luck with your fridge hunt! I love my LG fridge too! This is the one I bought for my new house, http://www.sears.com/lg-24.7-cu-ft-french-door-bottom/p-04689970000P , to save money I bought a floor model version that had a small ding in the freezer drawer but otherwise looks and works perfectly! I LOVE having the ice and water in the door, it really doesn’t take up much room. Oh and I forgot to mention that since I bought it at the Sears Outlet center (on Amill/183) and it was a floor model I got it for 600 dollars off and a free 3 year warranty. I know its still far away from you, but Dallas is getting a Nebraska Furniture Mart this Spring. We have one here in Kansas City and they almost always have the best deals for big purchases….like your LG fridge. Not sure how far they will deliver down there, but they did deliver furniture to my in-laws house which is 3 hours away from KC. We have found that they can almost always go down a little bit on their tagged price if you ask. If your salesman tells you they can’t, find a new salesman. Also, their website does not do them justice unfortunately. Their inventory is much more impressive than whats online. Beautiful appliances! Thank you for sharing these photos and the reviews on each appliance. It looks like you got some great quality appliances for a good price. How do you figure that the refrig, which I also love, is counter-depth? Counter-depth is usually 24” (without door). This one is 29, and almost 36” with door/handles. It does, and thank you. Love your site! Really helpful post! I really love these appliances! Thanks for the lovely photos and the reviews! Thumbs up! Greets, Lamorbey Carpet Cleaners Ltd. The appliances are great! The oven and the dishwasher are amazing! I really love them! The Bosh dishwasher is something that I want for a really long time! Thank you for sharing! Greets! Enjoyed your post/blog. We are about to have to replace those same appliances. I do have a question about the dishwasher. Which Bosch did you choose? Also is the stove a double oven or is it storage underneath? In our Texas house we bought the series 300 but in this new Colorado house we bought the 800 series (mainly because we didn’t want to wait to order it and it’s all Best Buy had). I’ll be honest, I LOVE the little seemingly useless extra drawer in the top. We use it daily. Worth the extra money! I am considering a stainless finish on a new range the exhaust hood is stainless and glass but white for the dishwasher and refrigerator. 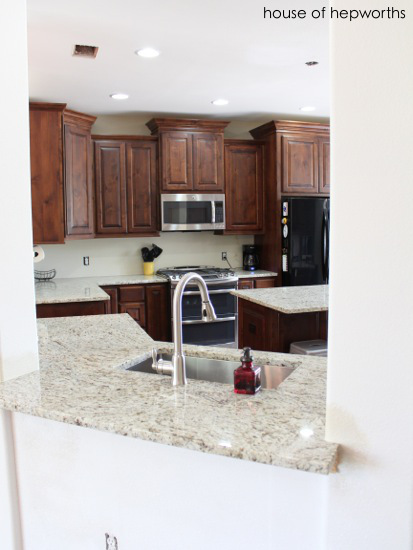 My cabinets are a light cream finish and the counters are a light cream quarts with a bit of grey and white, would this be a mistake ? I don’t think you can ever go wrong with a stainless finish.